Dominic Solanke believes Liverpool’s pre-season travels will have been a huge help to his personal development at the club. The 19-year-old has been in inspired form since joining from Chelsea at the beginning of July, scoring four goals and staking a claim to be far more than just an U23s player next season. Solanke emerged as a surprise package during Liverpool’s summer preparations, catching the eye of not only impressed fans but also Jurgen Klopp. “It has been amazing and I’ve settled in with the boys quite quickly and they all made me welcome straight away. To get away [on tour] meant there has been a lot of different experiences, so that has helped me,” he told Liverpoolfc.com. 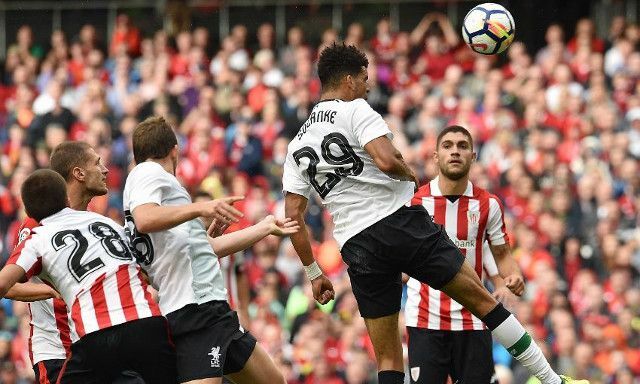 Solanke was on target yet again in Saturday’s friendly against Athletic Bilbao in Dublin, following up recent goals against Hertha Berlin, Crystal Palace in the Asia Trophy and Tranmere Rovers. Settling down hasn’t been a problem for the England U20 World Cup winner, although his true test will undoubtedly come when he makes his first Premier League appearance. A series of standout pre-season performances alone have seen a number of Reds tip him to compete for a first team spot with Divock Origi. It hasn’t just been his goal scoring that has drawn praise, but also his selfless runs off the ball, his tendency to drop deep and create chances for others, and his sheer physicality for someone yet to turn 20. With the right management, Liverpool could have found themselves a gem.